It always breaks my heart when I see a “store closing” sign in front of a place that I frequent. So when I started reading stories about how Borders was filing for Chapter 11 and closing 30% of its stores, I immediately panicked and assumed our local store would be one of the ones to go. Sure enough. When pulling up to Borders earlier this week, we were greeted with a giant yellow “STORE CLOSING” banner, and a parking lot that was more packed than I’ve ever seen it, even during the holidays. Despite my sadness, I felt like I was on a treasure hunt, and I immediately began searching for the books I had been putting off buying. Unfortunately, somebody had already beat me to the Chuck Palahniuk books, which I needed to restock after lending out way too many of my copies and never getting them back. 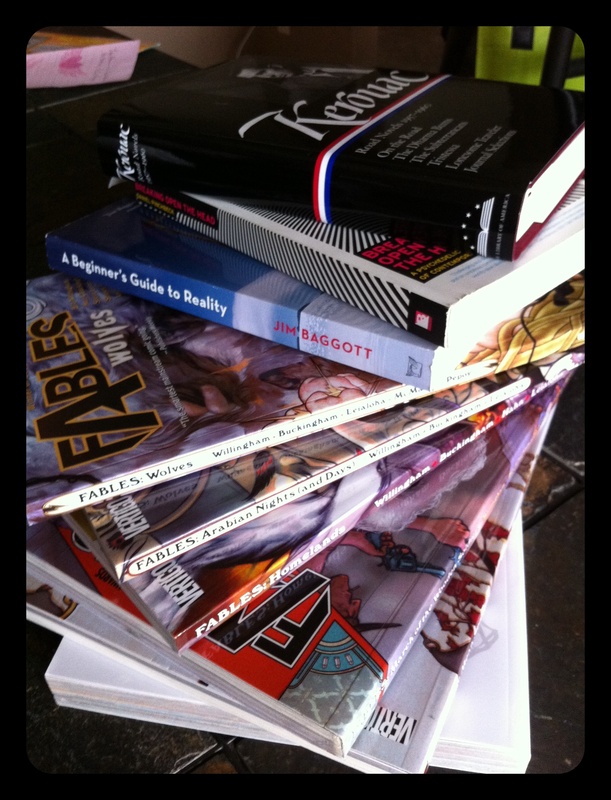 However, The Owl stocked up on some Grant Morrison, books on social science and realism, and other gems that have inspired him to discover how we can live another 200 years. Yikes. Meanwhile, I caved to my new obsession and almost have a complete set of Vertigo’s Fables, which is a series that takes fairy tales and tells you what happens after the “happily ever after” ends. But my most exciting purchase was the hardback Jack Kerouac book I found, which combined my very favorite novel of all time, On the Road, with his other novels: The Dharma Bums, The Subterraneans, Tristessa, Lonesome Traveler, and selections from his journal. Jackpot. As sad as losing Borders will be, I am beyond ecstatic. We both have a lot of incredible reading to do. The one in Normal is closing too. The one that devastates me, though, is the one on Kauai. It was literally the only store that I had any use for on the entire island. It’s going to be so bad there without it that I don’t even know if I want to go back. It was such a big part of my weekend routine on the way to and from the beach, to stop by there and mill about, find something to read on the beach or something to listen to on the drive home. Anyway, I went to the Normal one last weekend. The check-out line was literally to the back of the store. I went looking for comics. Realized I’d already bought everything from that store that I wanted in the weeks prior. Wanted some DVD’s and music too, but it wasn’t long before I realized that 20% off at Borders is still more expensive than a lot of other places. I wanted a few books, but I wasn’t waiting in that line for them. As terrible as the CD and DVD selection at Border’s had gotten over the years (you could literally see the floorspace devoted to them shrinking by the minute), I hate to see the number of places that you can buy old-fashioned books reduced. Glad you dig Fables. I picked them all up on a whim a year or two. Absolutely LOVE it. I’ve got the last 2 voumes that have been released, but I haven’t read them yet. Thanks for reminding me!